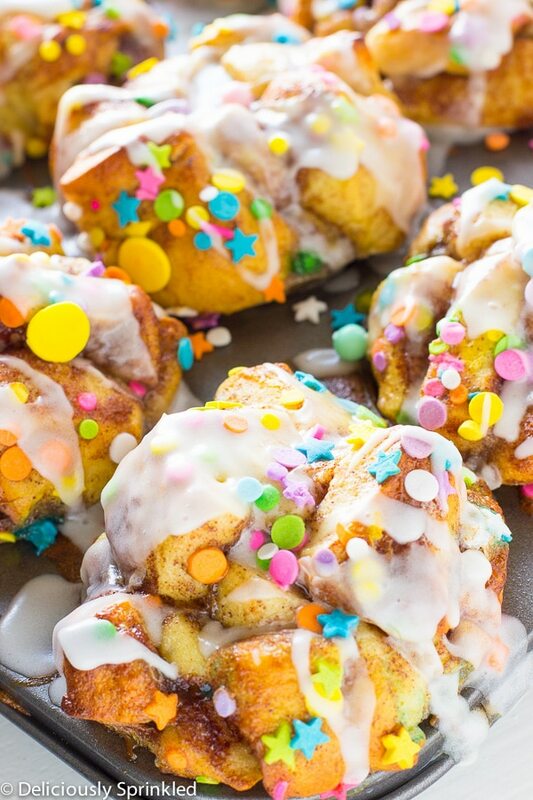 Seriously, not only are these Funfetti French Toast Muffins absolutely delicious, they’re also super simple to make. 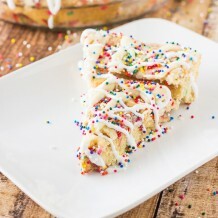 Like almost all my recipes on my website! These muffins make the perfect weekend breakfast or you can change out the SPRINKLES to coordinate with your party or holiday celebration, the options are endless when it comes these muffins. 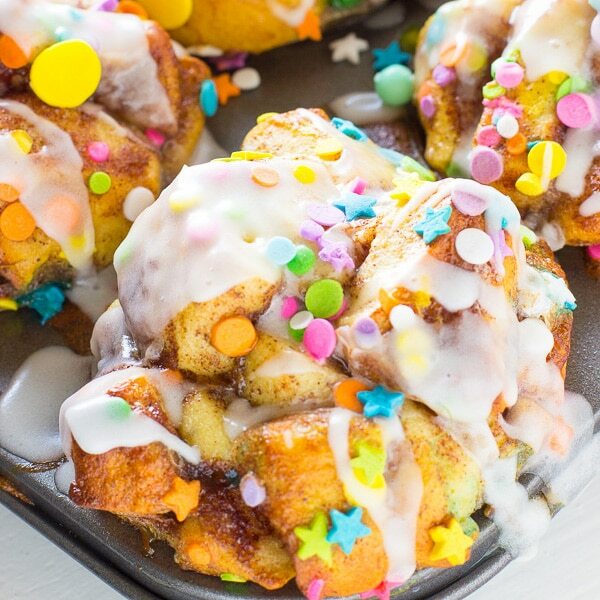 To make these Funfetti French Toast Muffins, I started out by cutting up Pillsbury Grand Cinnamon Rolls into pieces. I then made the traditional eggs mixture for french toast but rather than using milk I used International Delight Sweet Cream creamer. The Sweet Cream creamer gives these muffins that added vanilla flavor that you wouldn’t get from regular milk. 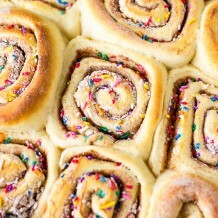 Lastly, I used the icing from the cinnamon rolls to drizzle on top and sprinkled each muffin with SPRINKLES! 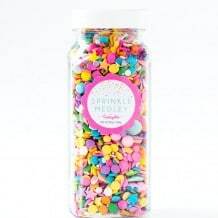 ✓ SPRINKLES: I love Sweetapolita’s Sprinkle Shop! She has a TON of super fun sprinkles, like the sprinkles I used to make these muffins! Preheat oven to 375F degrees. 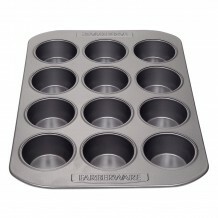 Spray muffin pan with nonstick spray. Set aside. In a medium-sized bowl, whisk together creamer, eggs, cinnamon and vanilla. 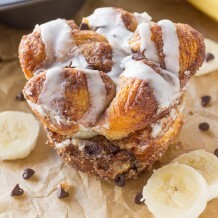 Unwrap packages of cinnamon rolls, set icing aside. Cut rolls into 8 pieces each. Place pieces into egg mixture, stirring to coat. Place 6 pieces into each muffin tin. Spoon any remaining egg mixture over the top of each muffin tin. Sprinkle the top of each muffin with sprinkles. 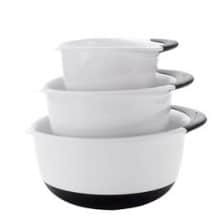 Pour icing into a microwavable bowl and heat for 7 seconds. 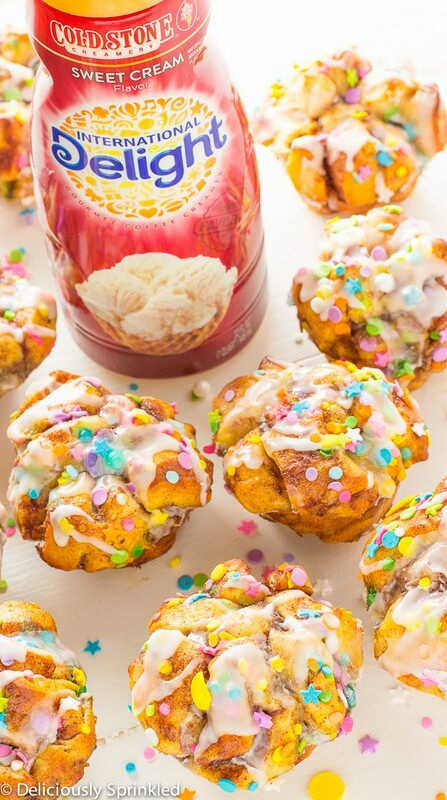 Spoon over each muffin and top with more sprinkles.